In addition to temples, and tuk tuks there are many markets in Thailand. The Damnoen Saduak floating market was about an hour and a half out of Bangkok but it was worth the drive for the experience. There are a few floating markets in and around Bangkok which are primarily for tourists. We were dropped off at a boat dock where we boarded long tail speed boats. The ride was terrifying. We rode through man made canals and saw homes, temples and shops. The boat driver was a bit of a speed racer. It was rough and the water was a lovely shade of brown. We ended our speed boat ride at the floating market. Boats full of everything imaginable could be found in the floating market but most vendors were selling food. Anyone want a banana? How about a mango? Coconut? Next up the Sampran Riverside Village followed by a day at Elephant Hills. Last weekend, I got pickled. I spent Sunday with a group of moms on the Victoria Harbour Ferry Pickle Pub Crawl. Unfortunately, we picked the only rainy day in Victoria all summer, but we weren’t going to let a little rain stop us! Another summer break has come and gone. The kids are heading back to school in a few short days and I am too. My reading in the next few months will consist of textbooks :(. I am still hopeful that I will get in a little light reading as well. I had so many books (and chores) on my to do list this summer and I only just grazed the surface of both lists. For whatever reason the fall is typically the busiest time of year for me, and reading falls by the way side, but I am planning to do something about that this year. If I write these lists of books I feel as though I am being held accountable, even if only by myself. Last week, I was writing about being a tourist in my home town, so it’s only fitting that today I write about exploring Victoria. My first trip to the Butchart Gardens was a magical memorable day. My boyfriend had just moved to Victoria, BC and I visiting from Toronto. We were young, childless and carefree. We woke up on a Saturday morning and he told me that he had to run out for a bit. When he returned, without any words he tied a string to my finger. Just a plain beige string, nothing fancy. He held the other end in his hand. I looked at him with a puzzled expression not understanding what was about to happen. Next I felt a ring on my finger. My ring finger. Still no words from him. He never officially asked but that was the moment that we got engaged. Lions, Tigers and Bears oh my. While we were on vacation in Ontario we spent a day at Safari Niagara, which is home to many animals including Lions, Tigers and Bears. This was our second trip to the park but it had been three years between visits, so my almost four-year-old had no memory of his first trip. He was a little apprehensive when he learned that the animals were alive! Sometimes I forget the innocence of my little people, but once he learned that he would be safe while seeing animals he was ready for the adventure. I am a little late to the party this month, as I was on vacation for the first week of August. I had four books listed on my July reading list but I only made it through two of the four. As I read a fair amount I rarely buy books instead I rely on my local library which can be hit or miss. Sometimes I can get a book right away and other times I wait months to get my hands on a best seller. I picked up a third book not on my reading list based on a readers suggestion and I was not disappointed. I grew up in the small town of Welland Ontario, recently I returned to visit family. During my stay my mother pointed out a new restaurant and suggested that if I had the chance I should try it. When making dinner plans with a long-time friend she also suggested Taris on the Water, although she hadn’t been there she had heard good things. A couple of weeks ago a fellow blogger Samantha Sali was looking for other bloggers to review her recently published book. As an avid reader I jumped at the opportunity to read a freshly released book. 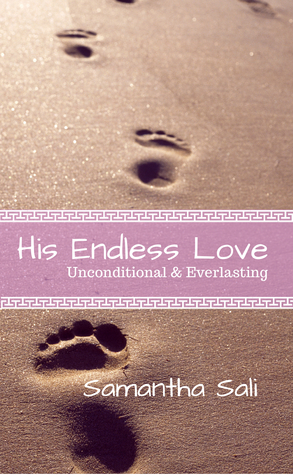 His Endless Love is written about the power of God’s love, and for those of you that know me well don’t be alarmed. Since I was diagnosed with a brain tumour earlier this year my reading preference has shifted. Initially I shied away from books centered around illness, death or trauma, and I was more drawn towards self-help and non-fiction. I have always been interested in and read self-help books because I feel that I could always be a better person. To be totally honest I didn’t know that the book that I had just volunteered to review was about God’s love (but I should have figured it out from the title). I was pleasantly surprised that while His Endless Love is centered around biblical teachings, and more specifically God’s love that it wasn’t evangelical. Author Samantha Sali shares her story about growing up in an abusive home and how her belief in God helped her through her situation. In the first chapter Love is… she adds a variety of quotes about what love is and this particular one stuck me. It sounds a little dark but in truth we are all a little broken. Each of us has something or a series of things that have beaten us down. Accepting ourselves and others as we are is key to having loving relationships. To love is a choice as is being open and accepting of love. As I was reading her book (more critically than I normally would have) I started thinking that the premise of the book could be improved upon if she shared the stories of others in addition to her own. It was as if she read my mind because the next chapter was a story about a youth pastor that had just lost his family in a car accident. While the pastor’s story was tragic Sali focused on the positives that can come from a bad situation. Finding the good in a bad situation is what I have been trying to do over the past couple of months so this particular chapter was close to my heart. Congratulations to Samantha on the release of your first book. I look forward to reading your future works. The fine print: I was given a copy of the book to review but the opinions are my own.